Two top-priced rams ($8000 and $7000) go to Western Australia. Macquarie stud’s John and Grace Nadin, selling agent Chris Clemson Clemson Hiscox, Walgett, Peter, William and Robyn Nadin and auctioneer Paul Dooley. DOHNE rams are heading to four states after the 15th annual Macquarie Dohne production sale at Ballimore on Monday. In a 70 per cent auction clearance 101 of 146 rams sold to $8000 and averaged $1941. 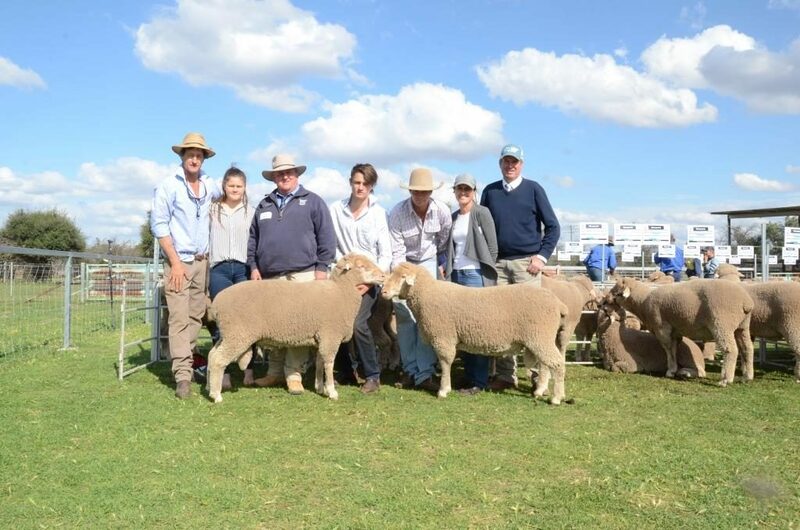 The change of venue for stud principals John and Robyn Nadin and family from their Mumblebone, Warren, venue to the stud’s Ballimore ram deport a little north of Dubbo, made it easier for old clients and new buyers to attend. The top ram at $8000 is a son of TR147388 and from a ewe of the Wardry family based on original Uardry genetics. It was purchased by Rachelle Browne for the Chirniminup Dohne stud, Nyabing, WA, and has Australian sheep breeding value (ASBV) figures in the top 10 per cent of the breed for post weaning weight (PWT) 6.0; post weaning eye muscle depth (PEMD) 1.8; post weaning fat (PFAT) 0.9 and a base index of 173.2. Second top-price of $7000 was paid by Ian Longmuir, Mollerin Rock stud, Koorda, WA, for a son of high performing ram by ULO150084 and from a n Empire family ewe. This ram is among the breed’s top 10pc for PWT 9.8; PEMD 1.9; PFAT 1.3; yearling clean fleece weight (YCFW) 21.3 and a base index of 194.7. The specially selected ram selling to South Australia at $4500 was a son of MD152068 with impressive performance figures was bought by the Webb family, Eagle Ridge stud, Cowell. Craig and Jude Ross, Lower Norton near Vasey and Hamilton, Victoria, returned and bought four rams averaging $3250 and topping at $4000 for the last lot sired by MD137021 and from an Empire family dam. The Ross’ will join 2000 ewes of 19.5 to 20 micron cutting an average 4.2kg fleeces while their wethers sell as suckers at 22kg carcase weight well before December, seasons permitting. Mrs Ross said in drier times wethers that haven’t gone by December are shorn and put on stubble to grow to heavy carcase weight. The O’Brien Brigalows Pastoral Company, Evandale, Come-By-Chance, returned to buy 10 rams topping at $3000 twice and averaging $2050. Chris and Helen Corrigan, Welbon Grazing, Garah, also returned and purchased 10 rams to $3000 three times to average $1750. Nearby, Andrew Yates, Delvin, Garah, returned for eight rams which averaged $1438 and topped at $2500 twice. Jim and Sue Currey, Aberfoyle, Walgett, were also multi-lot buyers returning for their 14th time to secure 12 rams while paying to $3000 twice to average $1708. They will join 4000 ewes of 20 to 21 micron next March/April for an August/September lambing. Mr Currey said the flock’s micron average hadn’t changed throughout the breeding-up years from their Merino flock. They feedlot their wether lambs and sell to Thomas Foods International, Tamworth, and also to Fletchers International Exports at time. O’Brien Family Trust, Cryon Station, Walgett, also long-time buyers, bought 12 rams to $3000 three times to average $2042. New buyer was Tony and Tanya Wright and family, Bundy Downs, Peak Hill, who have leased more country and have stocked with sheep. They bought 10 rams at $1000 each. The sale was conducted by Clemson Hiscox and Company, Walgett, with guest auctioneer, Paul Dooley, Tamworth.